If you are hosting any parties over the long weekend, you may be thinking about what eats you are going to serve to your guests. I always stress over the food, but my husband likes to take a more laid back approach to party hosting by planning out the drink menu. He figures as long as you have a good drink menu planned, who really cares what's on the dinner menu? In a way, he is a bit right. I noticed our party guests had a lot more fun whipping up margaritas at our Cinco de Mayo party last month than they did stuffing their tacos. This Memorial Day weekend is shaping up to a beautiful one for us, with nice warm temperatures and lots of sunshine, so Jason's already looking forward to sharing eats and a few good drinks with friends. 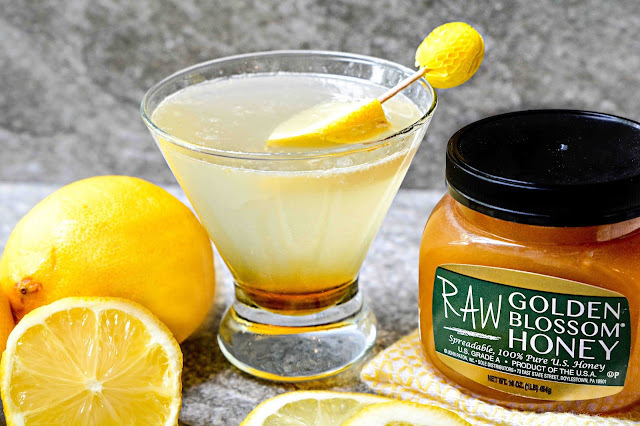 Nothing says summertime and sunshine quite like the citrus goodness found in lemons, so I found the perfect drink recipe to serve at our gathering this weekend in this Lemon Drop Martini from Golden Blossom Honey. Lining the rim of the glass with honey gives it a perfect combination of sweet and sour. A lemon drop martini is a great drink to serve while soaking up the sun, but carries well into the night served around a bonfire too. I do adore me the yellowness of lemons! Sadly, we get only the worst ones here, like the third or fourth category of quality, so most of ours smell a bit rotten :( The same goes for oranges. Too bad you can't grow your own. I told Jason that when we move to warmer temps, I will have a lemon tree in the back yard. Enjoy your free day off! These looks like a great drink. I will have to make this for our BBQ on Monday. Yummo! I love a good mixed drink. This would be perfect at one of our backyard parties. I love lemon! All of my favorite cocktails seem to have a citrus element to them. Lemon Drop Martinis are my favorite! I love that sour coupled with the sweet. Now this is the type of cocktail I can see myself sipping on the back patio during a summer evening! Lemon is so awesome for summer too. This sounds pretty good right now. It's definitely a good pick for Memorial Day. I'm hoping the weather will be nice so we can enjoy a few different drinks outside! I can't have a martini, but it looks wonderful! I love lemons! We're going to Kansas City to visit college friends. Luckily my niece lives there. She offered her place for us to stay + I get free tickets for blogging about Legoland. Then we have birthdays for the family - May ones. Sounds like a fun filled weekend! Soak it all in before you are down for the count after your surgery. I haven't had vodka in years but this recipe might tempt me back again! Rosey said your child is graduating. Many congratulations and best wishes to you and your family! That's super nice. I like lemons so much! And I love everything about it. This vodka looks great! I did a post for a lemon drop a few years ago. I think adding the honey is a great idea! I bet the flavor just pops! This looks like a good drink. My husband both loves martinis and also collects various cocktail recipes. So, I will be sure to share this with him. Sounds like the perfect drink. 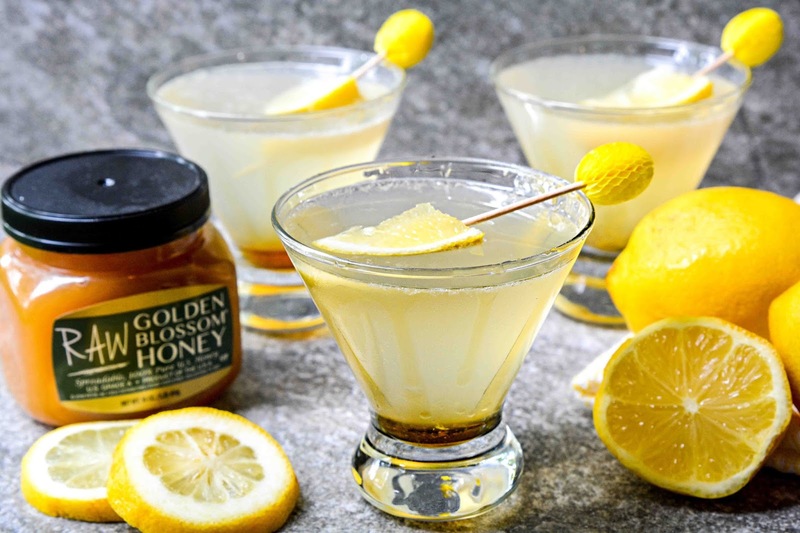 Lemon and honey... what could be more delicious? That sounds like such a yummy drink! I would love to try making this sometime! This sounds like the perfect drink when you have your girlfriends gathered in the backyard! I don't think I've tried adding honey in a martini before. It's a good combination, lemon and honey! I don't normally drink martini but I wouldn't mind giving this one a try to be honest. No doubt, Lemon Drop Martini is a good start of a party. They look pretty too. Hope you had an awesome celebration! Lemon with honey, a simple but perfect cocktail for my family. I love a good lemon drop martini! Even better to add some natural sweetness with the honey! I've never had a martini with honey around the rim but it sounds delicious. This sounds like a perfect summer drink and it has some of my favorite ingredients- I'll be trying it!